Today, I want to focus on the positive side of the doubles spectrum. What follows aren’t exactly duplicates, they’re parallels. 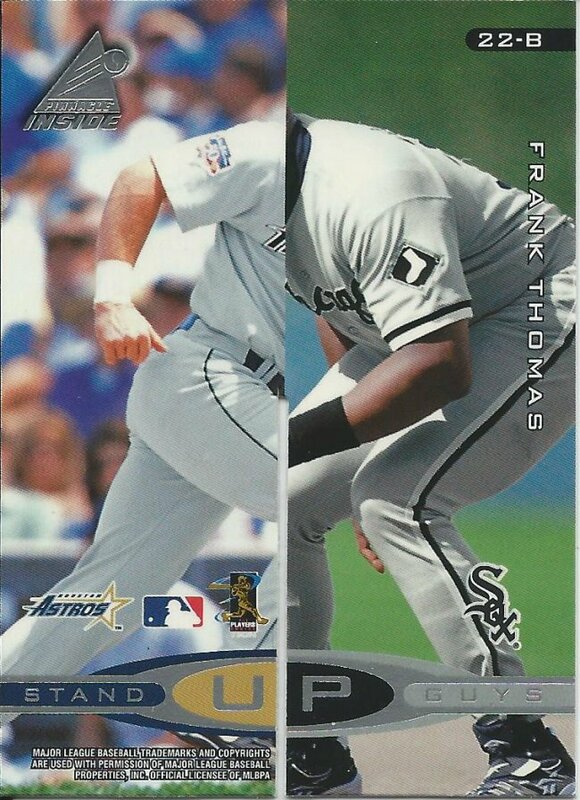 It’s understandable that some dealers would have more than one version of a particular card. If they bought someone’s player collection and is selling it off, or if they opened many boxes/cases of a product, it’s bound to happen. 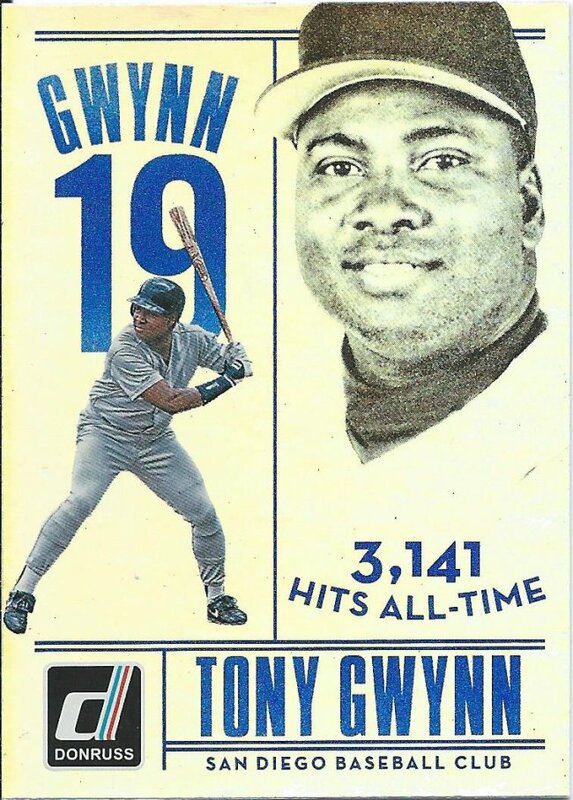 I originally thought about expanding this to inserts that I bought for multiple players, but it turns out that I had a ton of same player, same set cards as it was. 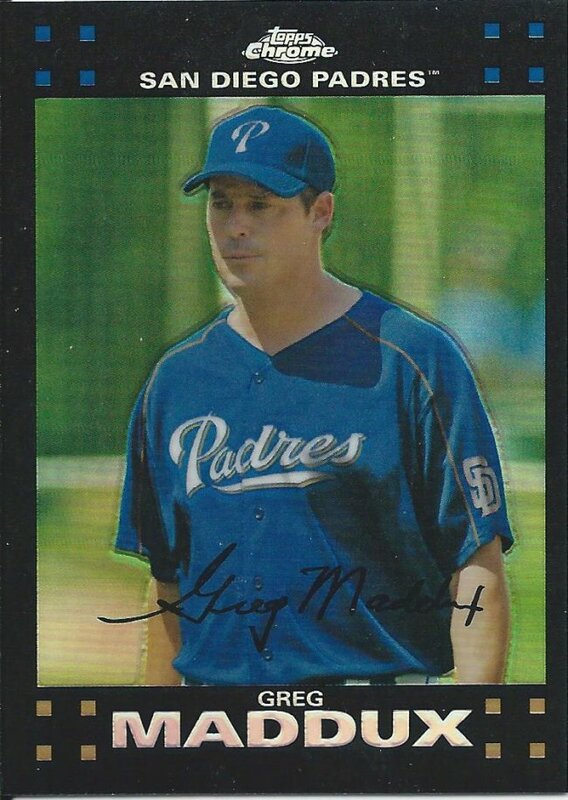 Oh, and keep in mind this doesn’t factor in the Moments & Milestones cards I grabbed. That will probably be a separate post. By probably, I mean definitely. So, what did I find all lumped together for my ease of use and purchase? 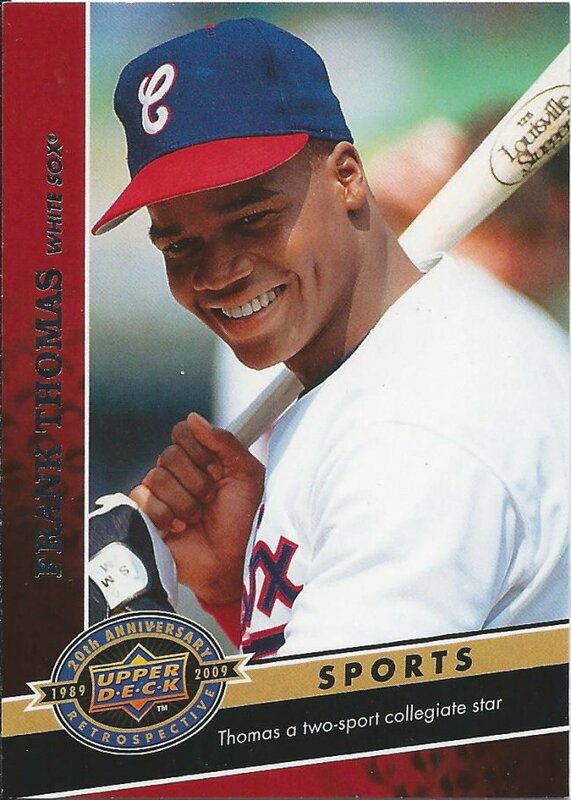 How about we start with some die cut 1997 SPx? This is the Bronze version. I have no idea how the rarity compares to others. What was great about this purchase is that the dealer had these labeled on the penny sleeves. That helped me quickly identify this as Silver. Trust me, that came in handy when looking at this next one. This is the Steel version, which looks very similar. Sadly, there are no markings on the back to tell you what you have. If I was making the decision, I would reverse the naming. 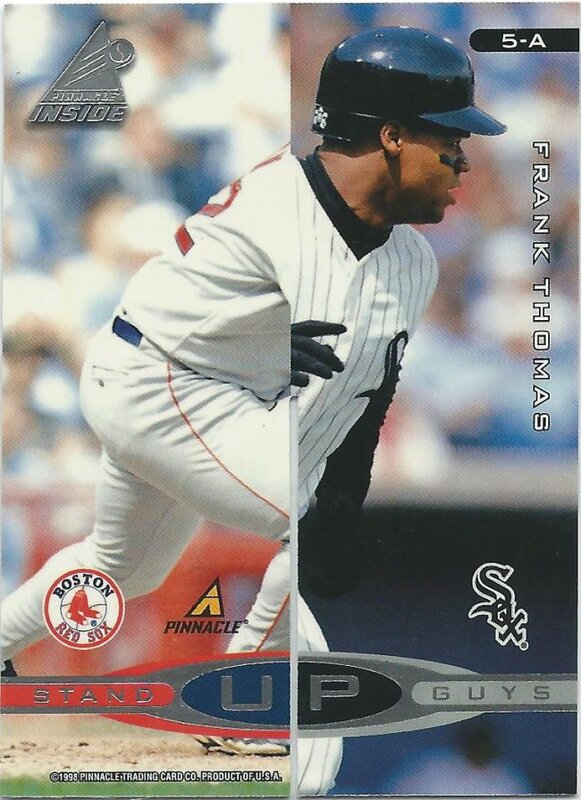 Pinnacle Inside was actually a product I hoped to find unopened. I would have loved to crack a few cans of this stuff. You can kind of see there is a empty space up the middle bottom. That’s because it was to be paired with another card. You are supposed to slide and interlock the cards to create a 4 player thingy. I have two separate halves here that don’t match up. These next few may be a little boring, so I’ll run through them quick. 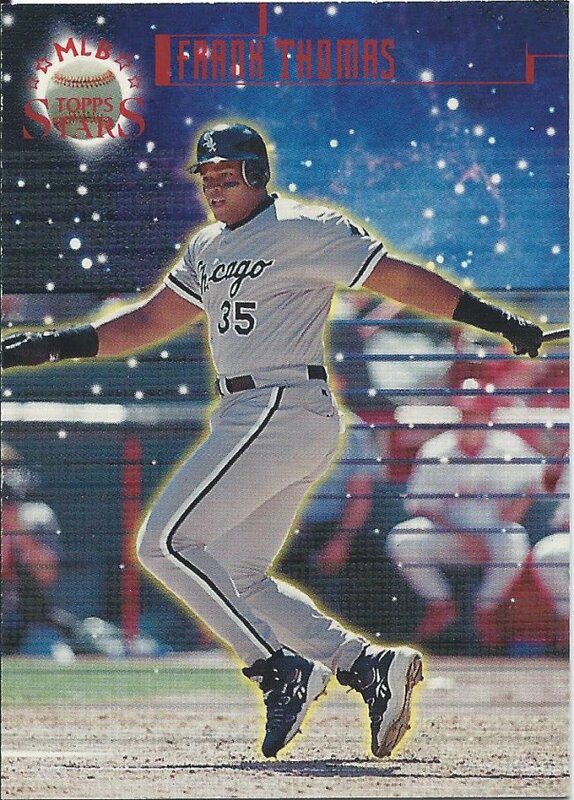 Marvel at the Silver foil of the all-numbered 1998 Topps Stars set. 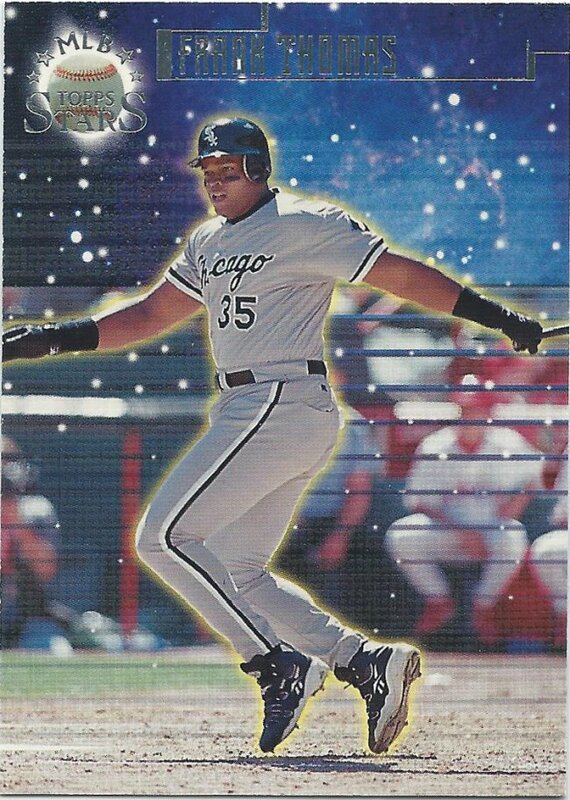 Kinda looks like a swing and a miss. 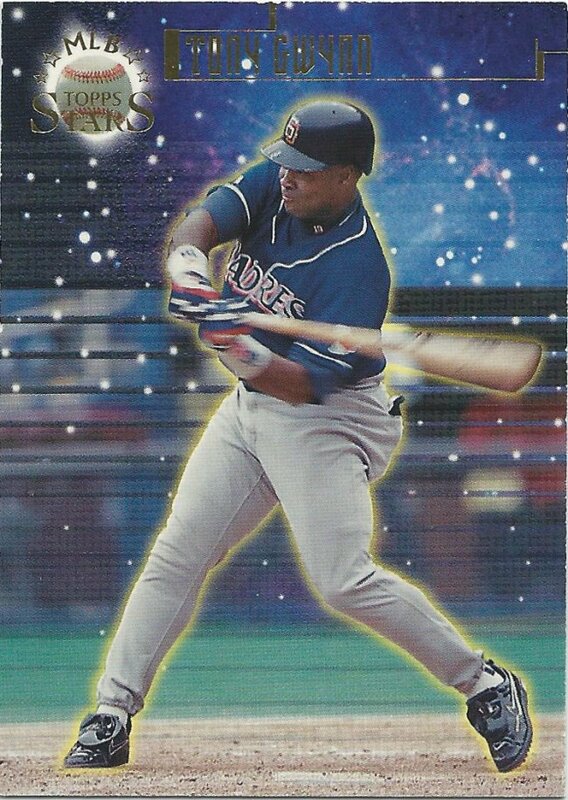 That ball is already past the bat, even though it’s not really a ball. You be the judge! Is this a Michael Jackson impression? Or, is it Pee Wee Herman? Or, is it a third thing that I can’t think of on my own? 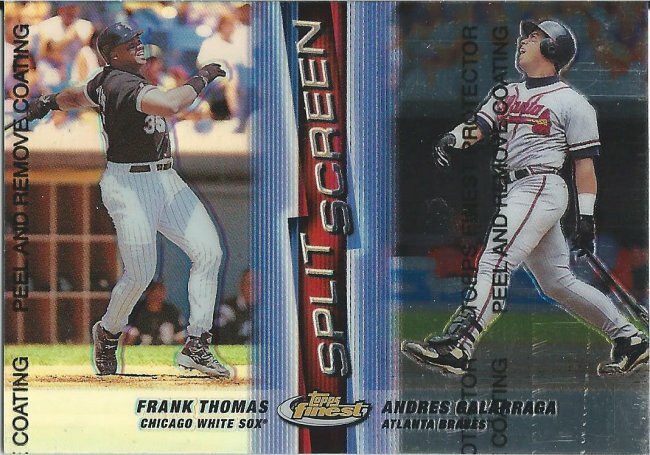 The 20th Anniversary set was a cross product set that included a lot of sports stuff, but also historical events, etc. I could look up how many cards are in the total set, but it’s in the 1000s. I’m actually slightly surprised there weren’t more than 8. 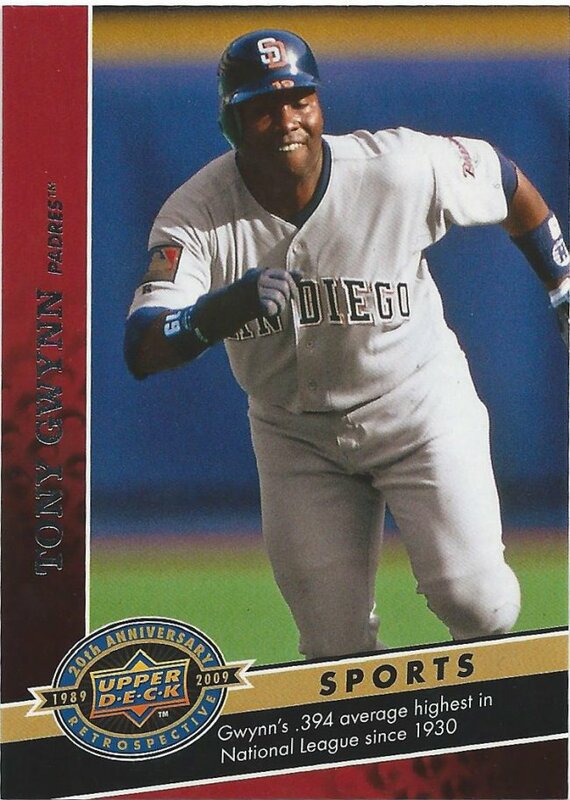 What I can tell you is that Tony Gwynn alone has 20 cards in the set with his highest number at #2300. The third one I got is the third I have total for him. 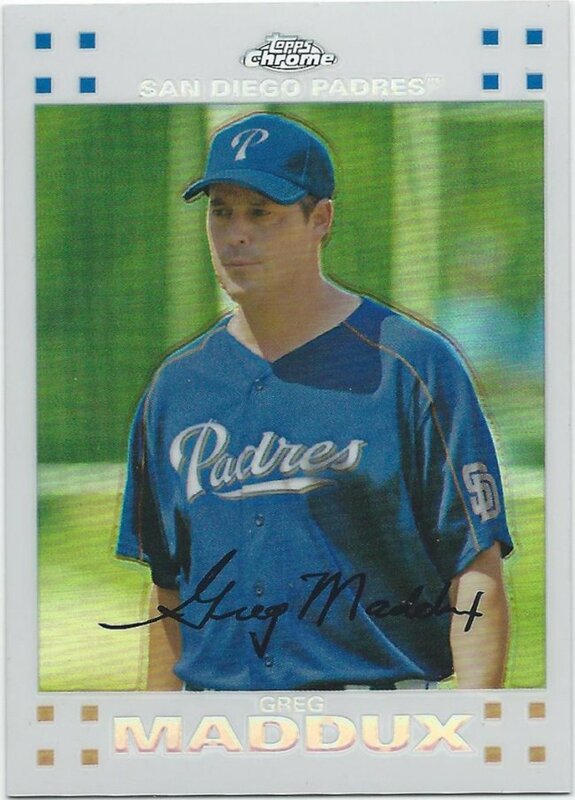 There are also 2 buybacks and 2 memorabilia cards to go after, which means I need 21 more. 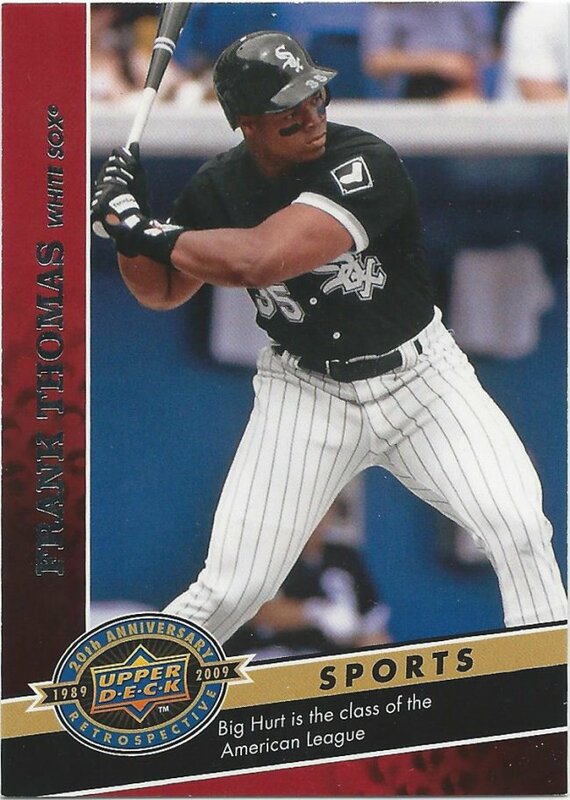 For Frank Thomas, it’ll be a little bit easier. Only 15 cards and 1 memorabilia and I grabbed 2 at the show. 5 down…way too many to go. 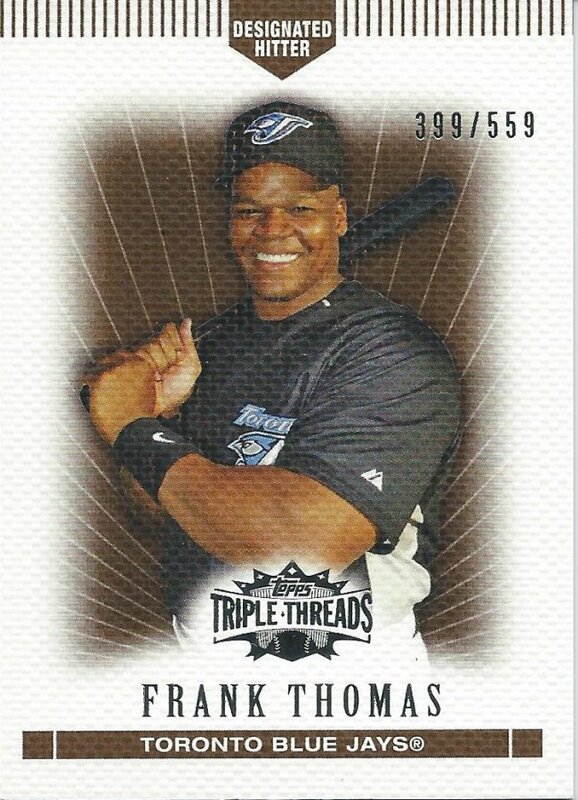 I wonder with the big set, how many of each card were made. If the print run ends up being fewer than 50 each, then I could ignore them all together. 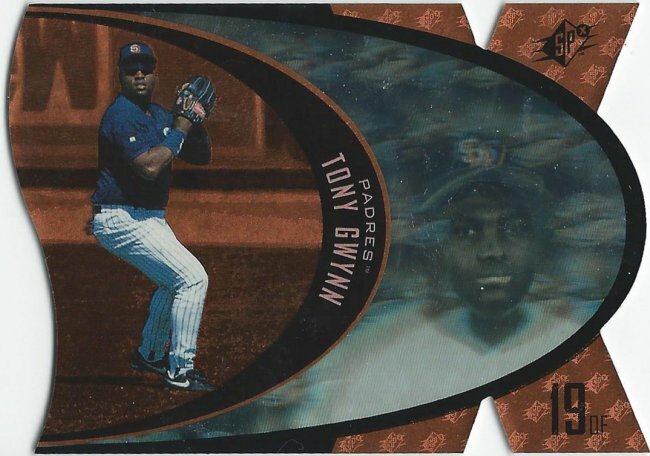 The 2015 Donruss set paid tribute to the late Tony Gwynn by creating a 5 card insert set (with parallels). 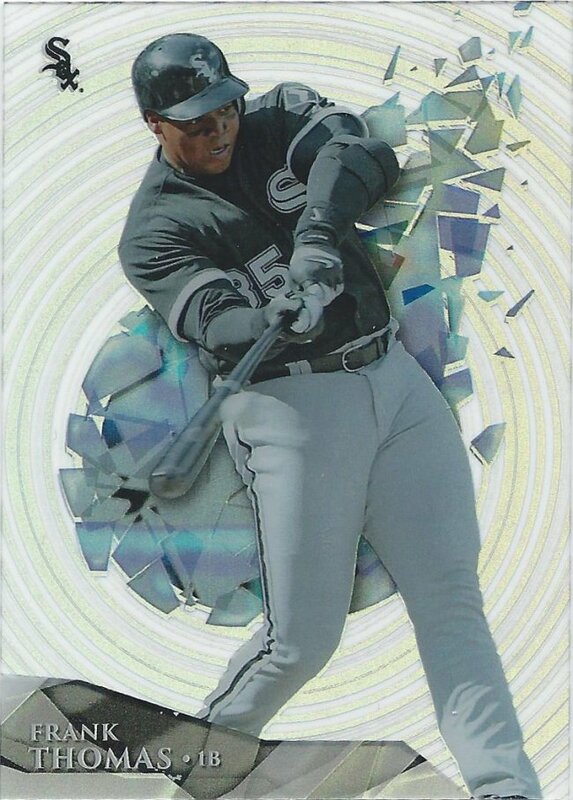 I grabbed 2 at the show and 1 came in the box of 2015 Donruss that I opened for myself. For some reason I thought there were retail and hobby versions, but I was wrong. 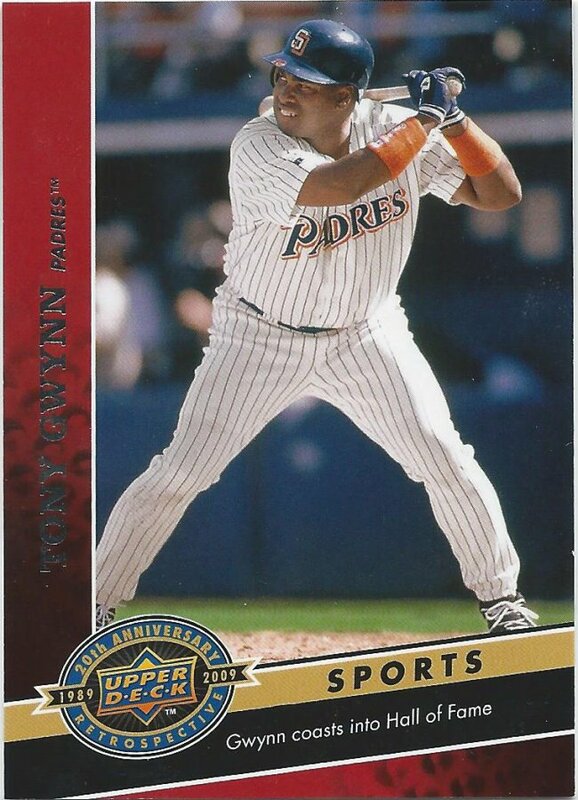 There are red versions /99, though. So…a total of 7 more to go. It’s extremely hard to tell, but this is the Hyperplaid (aka most common) version of the peel & reveal insert. 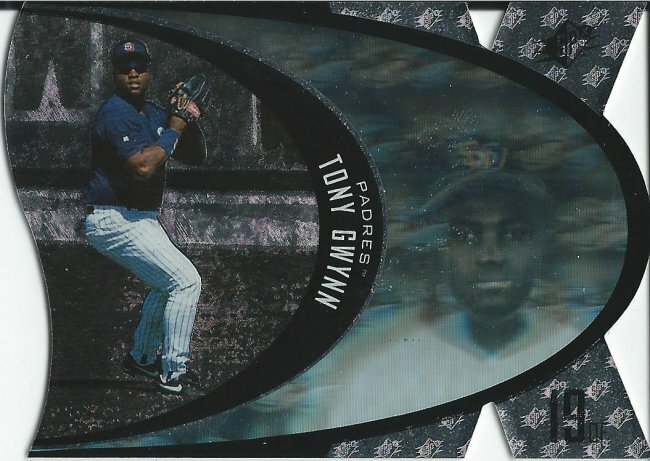 It’s an acetate card with a refractive pattern. In all there are three variations for each player. And this is the Sparkle (aka middle rarity) version. Here we can at least see a little something in the background, so you know I didn’t cheat and use the same scan twice. Not like anyone would care if I did, though. I’m now missing the Stadium Stars version to complete the set. 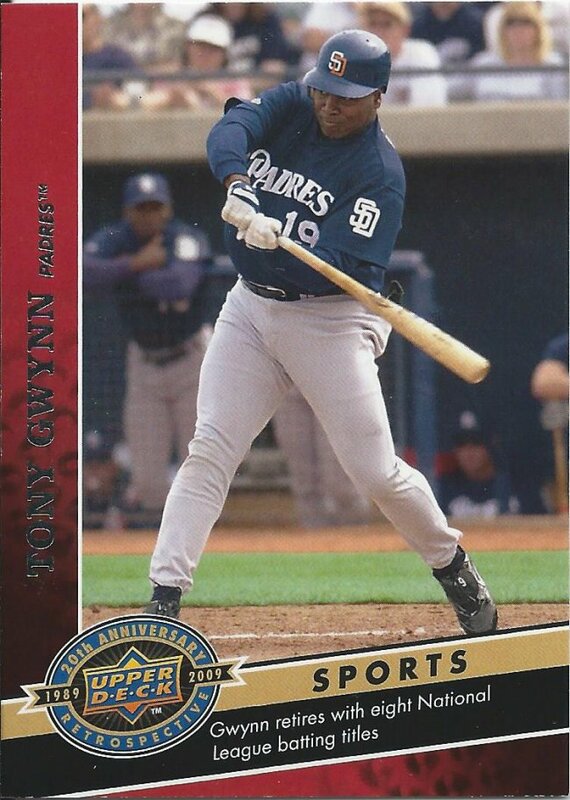 Sticking with 1999 Finest, we have another round of pointless variations. Split screen cards came in 3 (or possibly 4 types). This is the dual refractor where shiny occurs all over the place! 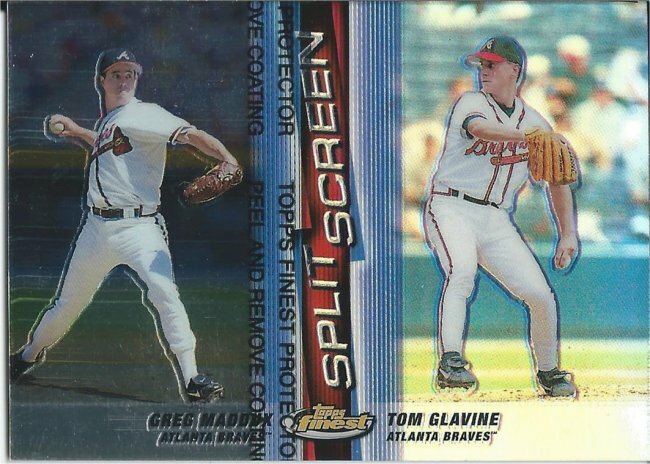 The one only thinks Glavine is worthy of sheen and shine. I’m not 100% sure if there is a variant where neither gets refracted. 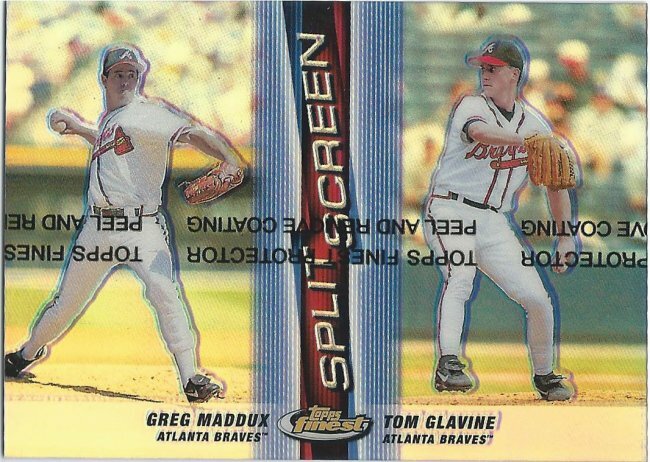 I think I’m only missing the Maddux side version. This should have stayed in the bins. It’s damaged on the back only. There’s a big ole crease straight down the middle that I somehow missed. I’m almost positive there was another dealer that had a better condition one I could have had instead. 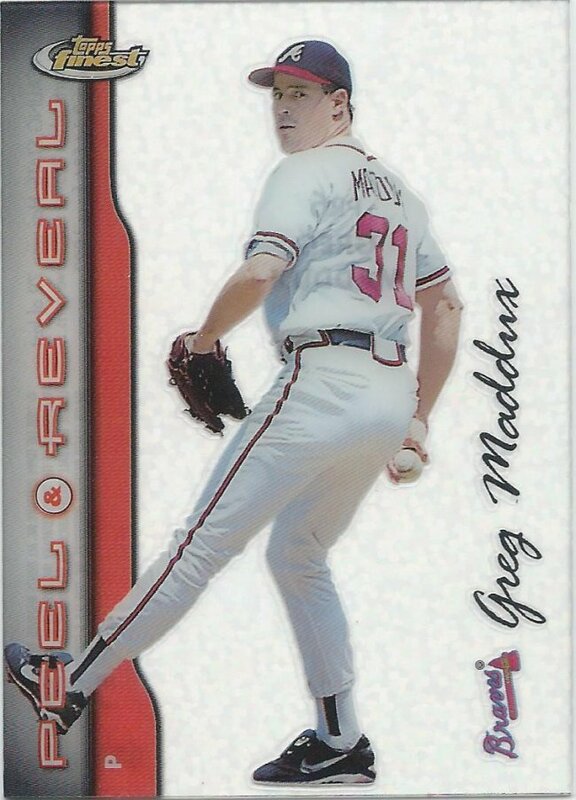 A lot of card companies took Maddux’ trade back to the Cubs as an excuse to produce multiples of a superstar. 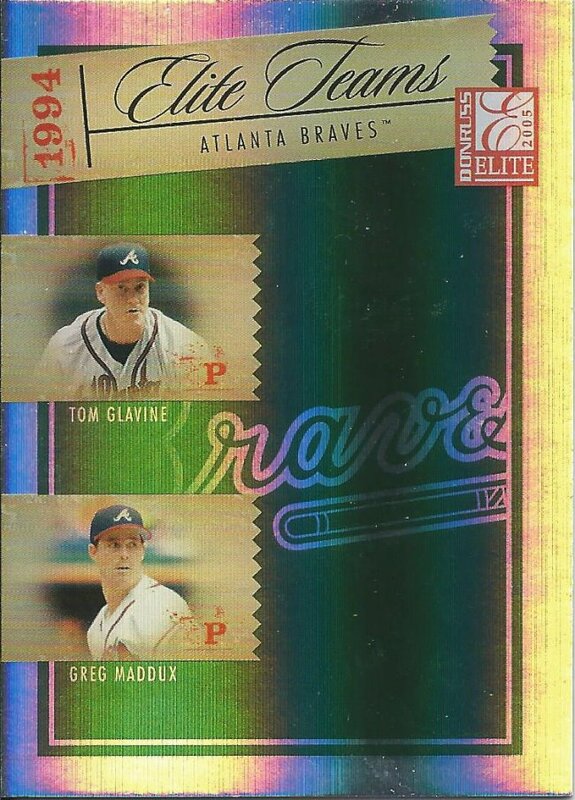 So, we have this higher end Braves card #/949. 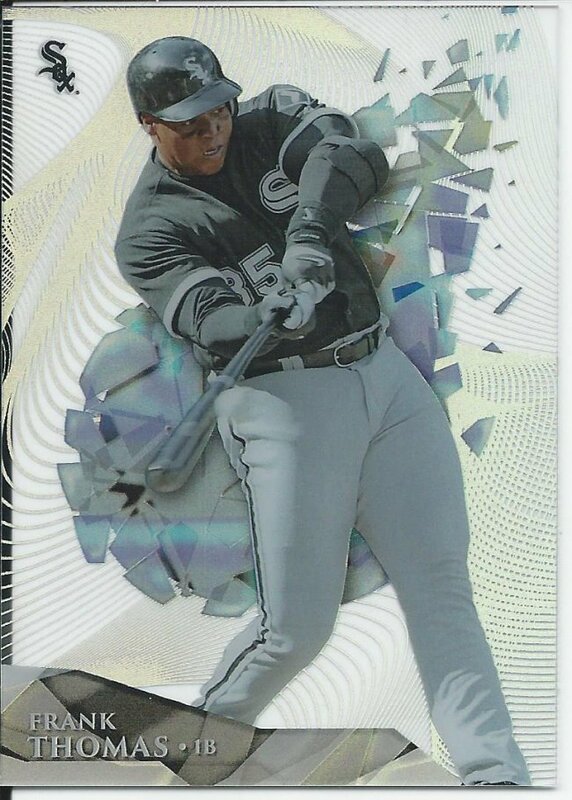 This Cubs version is also #/949. I really don’t know if they were separate series, or if wanted to milk the name. Regardless, they are in my hands now. 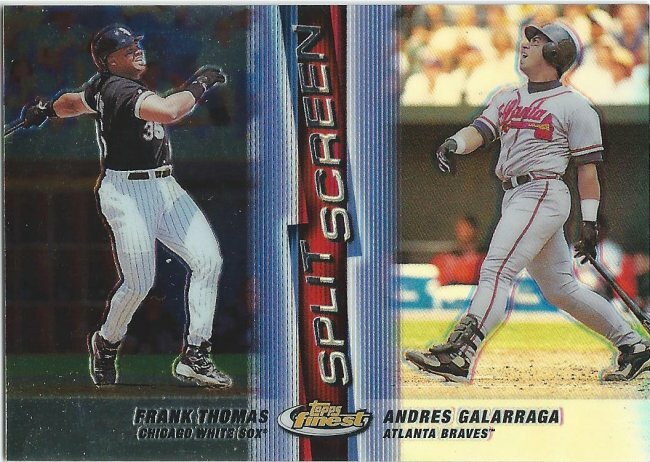 2005 was rich with the Braves & Cubs stuff too. 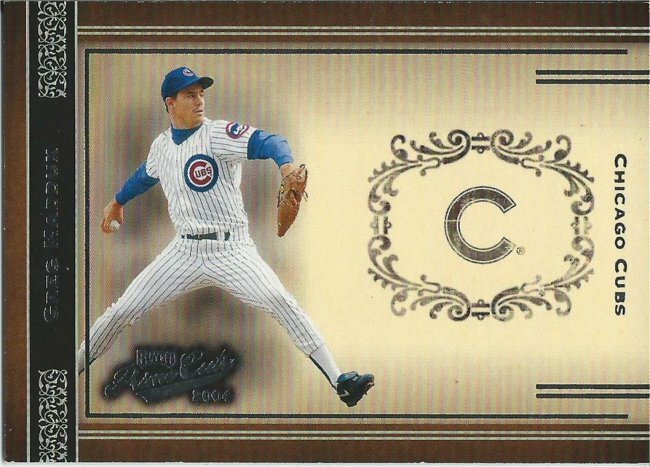 I have to show the back, because the front has Kerry Wood and Mark Prior. I’ll need another copy for the Wood collection. 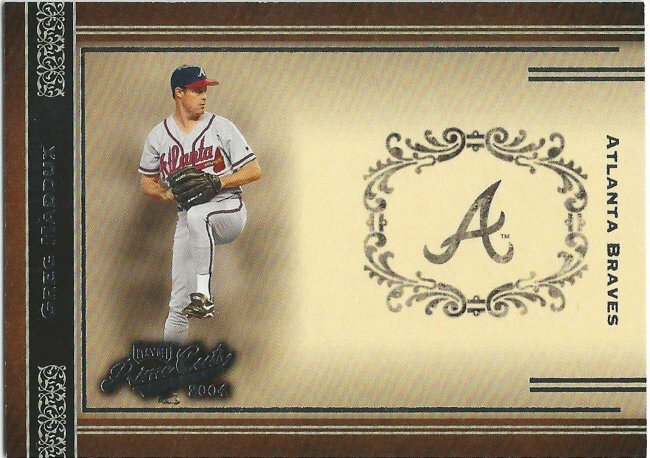 The back has David Justice and Ryan Klesko for some reason. 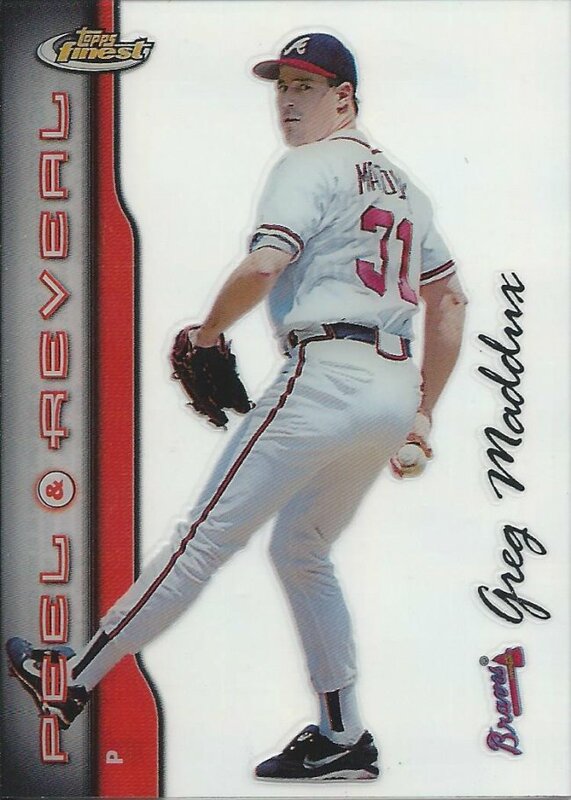 Maddux gets front billing on the Braves side, though. This Green is twice as rare at /750. 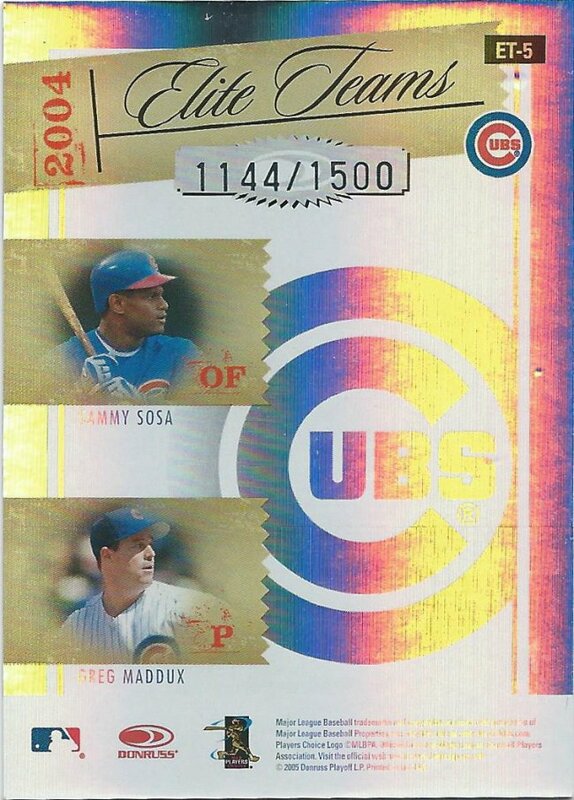 Also available are Blue /1000, Red /500, Black /250, Gold /100, and Jersey (varies) for both squads. 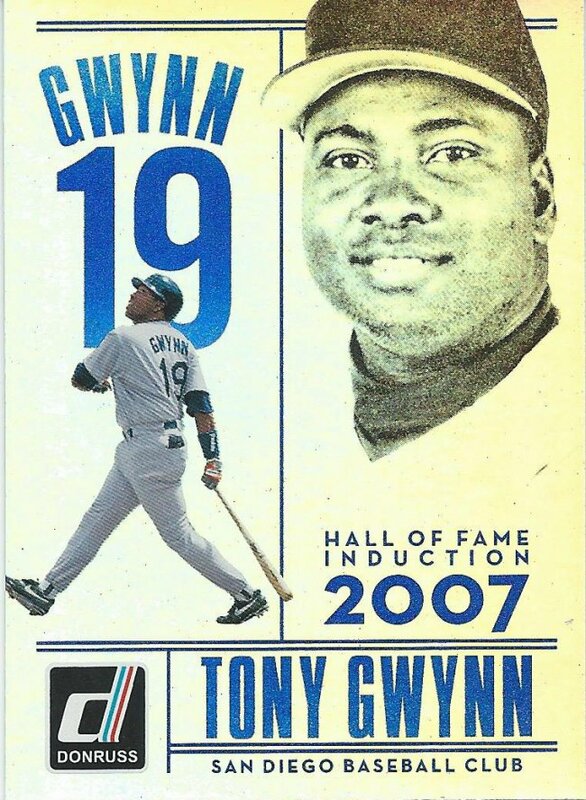 Kinda looks like the “P” from Topps Pristine. Pretty much all the Chrome I saw went into the “need” piles while searching. 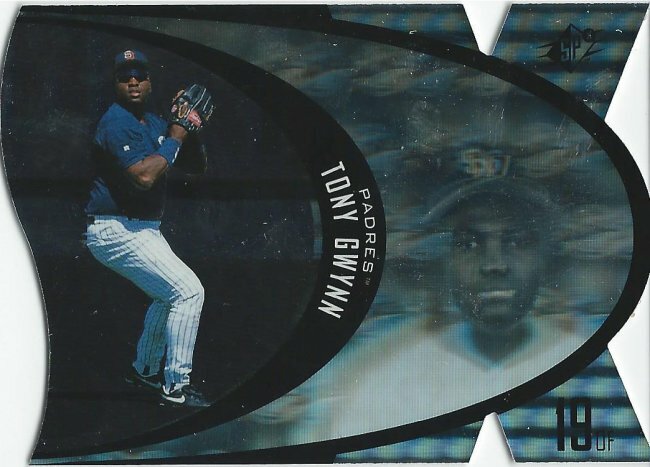 Basic chrome and refractor cards are sorely lacking from my collections thus far. Here’s a small stride. A slightly bigger stride is this White refractor /660. 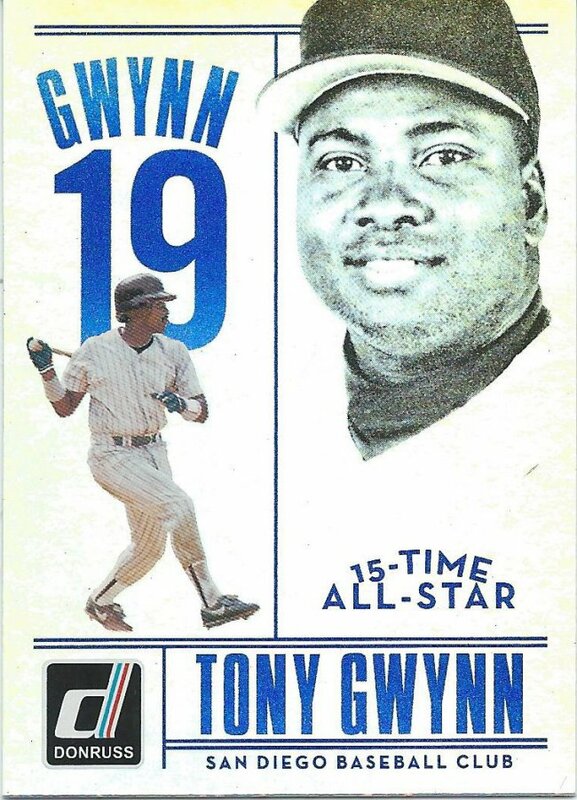 I think Topps made the right choice by not using white with this design. I don’t know if they made the right choice with the design overall, but that’s a separate conversation. I love picking up high end scraps on the cheap. Is it odd that I still want to open a box of Triple Threads even though there’s really no realistic incentive behind it? 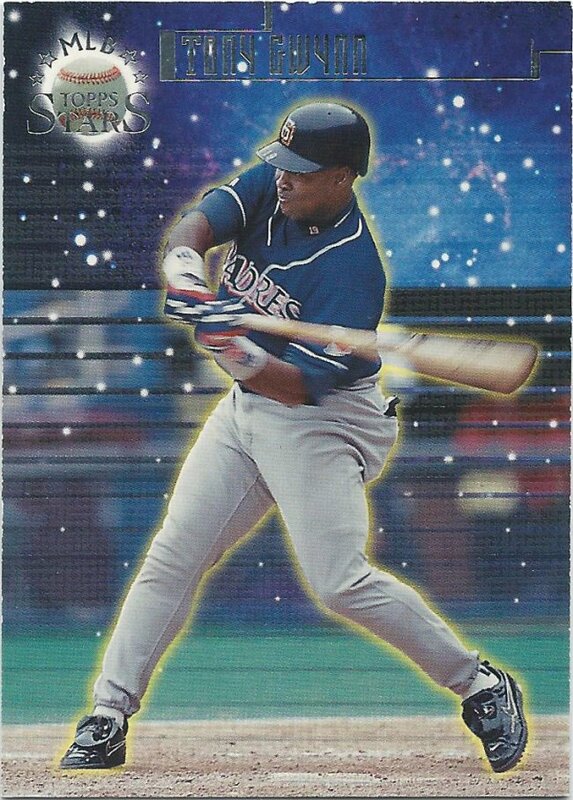 I mean, when you can get this for 50 cents or a buck, and most of the hits would be numbered out of my collecting range? I don’t know. Still something I hope to do if I ever make enough. While I didn’t find much of the old Tek sets, I did manage to find someone that had a couple of the new ones. First we have the more basic wave pattern that is used for all the color variants, etc. And lastly, we also have the spiral, which I would imagine is 2nd most common. Most of the patterns aren’t numbered, so scarcity is tough to gauge as an outsider looking into bins, but I do know that there’s still a long road to go for these and the Tek sets from the late ’90s/early ’00s.